I have to admit, I don’t know much about cars. In fact, I don’t know anything about cars, except they get me from point A to point B. And I’m fine with that. 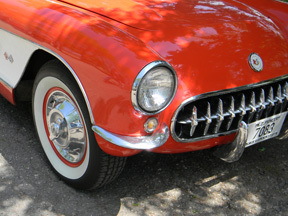 But you have to admit, looking at classic cars is pretty cool! This was my second year attending Devils Run. It was even better this year! I think my favorite part of Devils Run is watching them shine up their cars! The pride on their faces as they are on their hands and knees buffing them is what gets me! I wish the cars could talk. I would love to hear the stories that they have to tell. Some built from scratch and some restored for years of wear-and-tear and weather. 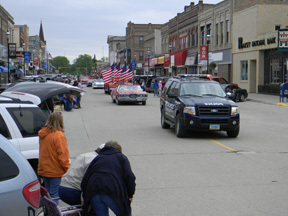 Saturday morning always kicks off with a parade down main street in Devils Lake. My friends Kaylee and Jaylen sold snow cones along the street. I was fortunate enough to be their first customer of the morning. Wishing it would’ve been hot chocolate because it was a little cold that morning, it still hit the spot. Thanks guys!! It’s the anticipation of seeing the American Flag move down the street that entices me and keeps me on my toes. It’s also my goal every year to find the best spot to take photos. I lucked out this year in front of Klemetsruds Plumbing and Heating. I might have to try that spot again next year. The entertainment also lists very high on my list. This year they brought in an Elvis duo to perform. Gospel hour on Sunday morning was amazing. The song Amazing Grace has always gotten me – but to hear him sing it… wow!!! Definitely put a chill down my spine. 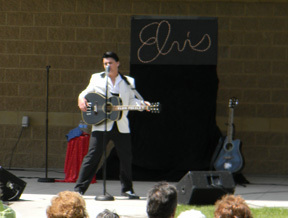 The younger version of Elvis is sung by his son. And if you can believe it, he’s only a senior in high school! I hope they come back again next year! I can’t forget about my boyfriend Jason. His nickname is “Woody” and he has a “Woody” t-shirt. 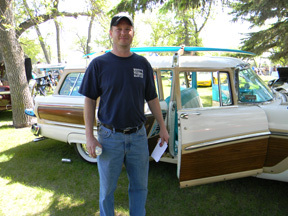 Every year he has to wear his t-shirt to the park and I find the Woody to take his picture in front of. I hope they come back again next year! Devils Run is always the first weekend of June. Next year is the 20th annual. If you haven’t been I think you should. Even a non-car girl like me gets a rush!